This study aims to evaluate the landscape transformation and the effect of the third Bosphorus Bridge construction works on the natural ecosystem over seven years’ time in two districts, Beykoz and Sariyer, located at the northern part of Asian and European Istanbul. The study applied supervised classification-maximum likelihood algorithm to monitor land cover changes using multi-temporal satellite data of Landsat covering study area for the years of 2009 and 2016. The overall classification accuracies are 92.36% with Kappa statistic of 0.89 for 2009 and 91.25% with Kappa statistic of 0.89 for the year 2016. The current study resulted with a rapid land cover change at the study area with approximately 4% and %1 decrease in forest and green area, 2% increase in both agricultural and urban/build up areas. Additionally, the destroyed area increased with approximately 1% of the study area in the 7 years period. Wu, J. 2008. Land Use Changes: Economic, social, and environmental impacts. Choices., 23(4): 6–10.Zhu, Z.; Woodcock, CE. 2014. Continuous change detection and classification of land cover using all available Landsat data. Remote Sensing of Environment., 144, pp. 152–171. Ibrahim, Mahmoud, M.; Duker, A.; Conrad, C.; Thiel, M.; Shaba, Ahmad, H. 2016. Analysis of settlement expansion and urban growth modelling using geoinformation for assessing potential impacts of urbanization on climate in Abuja City, Nigeria. Remote Sensing, 8(3), 220. Rahman, MT. 2016. Detection of Land Use/Land Cover Changes and Urban Sprawl In Al-Khobar, Saudi Arabia: An Analysis of Multi-Temporal Remote Sensing Data. 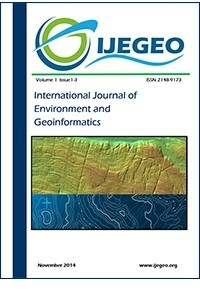 ISPRS International Journal of Geo-Information. 5(2), 15. Coppin, PR. ; Bauer, ME. 1996. Digital change detection in forest ecosystems with remote sensing imagery. Remote Sensing Reviews, 13(3–4), 207–234. Woodcock, CE. ; Macomber, SA. ; Pax-Lenney, M.; Cohen, WB. 2001. Large area monitoring of temperate forest change using Landsat data: generalization across sensors, time and space.Remote Sensing of Environment. 78(1–2), 194–203. Dogru, OA. ; Bektas Balcik, F.; Goksel, C.; Ulugtekin, N.2006. Monitoring coastal dunes by using remote sensing and GIS integration in northwest Turkey: A case study of Kilyos dunes. Fresenius Environmental Bulletin PSP,Volume 15 – No 9b, pp 1216-1220. Goksel, C.; Musaoglu, N.; Gurel, M.; Ulugtekin, N.; Tanik, A.; Seker, DZ. 2006. Determination of land-use change in an urbanized district of Istanbul via remote sensing analysis. Fresenius Environmental Bulletin (FEB), 15(8A), 798-805. Seker D.Z., Tanık, A., Citil, E., Ozturk, I., Ovez, S., Baycan, T. 2016. Importance and Vulnerability Analyses for Functional Zoning in a Coastal District of Turkey. International Journal of Environment and Geoinformatics. 2016.Vol 3.,Issue3, 76-91. Kardoulas, NG. ; Bird, AC. ; Lawan, AI. 1996. Geometric correction of spot and Landsat imagery: A comparison of map- and GPS-derived control points. Photogrammetric Engineering and Remote Sensing, 62, pp 1173–1177. Gong, P.; Xu, B. 2003. Remote sensing of forests over time: changes types, methods, and opportunities. In Remote Sensing of Forest Environments: Concepts and Case Studies, Woulder M, Franklin SE (ed), 301–333, Amsterdam: Kluwer Press. Jensen, JR.. 2004. Introductory Digital Image Processing: A remote sensing perspective, (3rd ed. ), Upper Saddle River, NJ: Prentice Hall. Lunetta, RS. ; Knight, JF. ; Ediriwickrema, J.; Lyon, JG. ; Worthy, LD. 2006. Land-cover change detection using multi-temporal MODIS NDVI data. Remote Sensing of Environment, , 105(2), pp 142–154. Weber, R.M. ; Dunno, G.A. 2001. Riparian vegetation mapping and image processing techniques, Hopi Indian Reservation. Photogrammetry Engineering Remote Sensing. 67(2), 179–186. Smits, PC. ; Dellepaine, SG. ; Schowengerdt, RA. 1999. Quality assessment of image classification algorithms for land cover mapping: A review and a proposal for a cost based approach. International Journal of Remote Sensing, 1999, 20, 1461–1486. Congalton, RG. ; Green, K. (1999) Assessing the accuracy of remotely sensed data: principles and applications. Lewis Publishers, Boca Raton, Fla, 43-64.